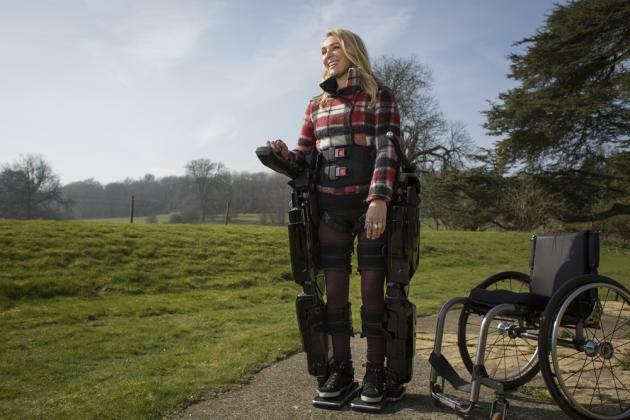 "Rex Bionics Plc (The Rex Bionics Group) is the global technology leader in robotic exoskeletons (REX). Uniquely, REX® provides independent mobility to wheelchair users and other mobility impaired persons using advanced robotic technology, custom–designed electromechanical actuators, precision engineering, and specialised networking systems. The key differentiator of REX is the fact that it has been designed from the outset to provide mobility to non–ambulatory wheelchair users rather than as a means to enable otherwise fit individuals to lift supra–physiological loads, enhance endurance or aid mobility of those able to walk with crutches. The device is designed to enable all users to stand and walk, and REX Personal™ users to scale stairs and navigate slopes."